Review: Hot Casa's latest must-have release is a veritable smorgasbord of Togolese treats. 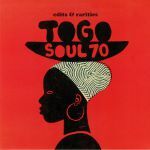 It focuses specifically on obscure soul music made in Togo in the 1970s, with two hard-to-find original cuts being joined by two contemporary re-edits of similarly obscure classics. The EP opens with Bosq's smooth, dancefloor-focused tweal of Yta Jourias's breezy, horn-heavy tropical soul workout "Adome Nyueto", before Pushin Wood takes over and adds a little contemporary electronic bounce - and some particularly colourful synths - to Roger Damawuzan's "Loxo Nye". Over on side B, Napo De Mi Amor's "Cacatchoule Berceuse Bassari" is a fuzzy soul shuffler rich in bright, Juju style guitar solos, hazy vocals and Hammond organ stabs, while Sewavi Jacintho's "Miade Dua" is a sweatier and heavier concoction powered by loose-limbed drumming and sun-kissed instrumentation.